We had a hail storm night before last, golf ball size hail. It pounded our roof, it sounded allot bigger, so KJ called a roofing company to look at it. It only put around 8 to 10 dings in it, I was surprised that was all. so it is still in good shape. If we get anymore damage this week. We are going to put a metal roof on. It is spring time storm weather, y'all be safe. We are getting some crazy swings in the weather too. Day to day temp differences of 30 degrees. (05-22-2017, 01:32 AM)Kreeper Wrote: We are getting some crazy swings in the weather too. Day to day temp differences of 30 degrees. WOW, that kinda of temps brings colds on. 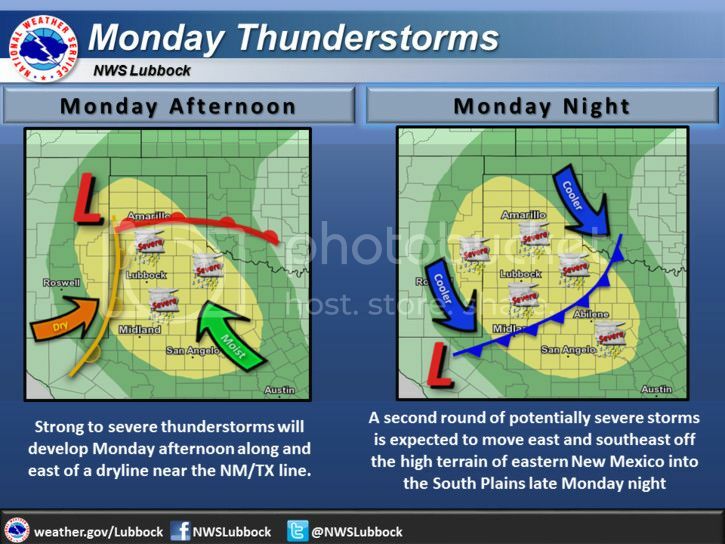 will be large hail and damaging winds. Stay safe! I'm in the upper Midwest. Things are calm here tonight. (05-22-2017, 04:43 AM)Adde Wrote: Stay safe! I'm in the upper Midwest. Things are calm here tonight. Be safe Adde, Midwest storms will pop up in a blink of an eye. We've had an extremely chilly May with snow off and on It finally warmed up a bit, was 18C yesterday and it's going to be another lovely day today. (05-22-2017, 08:36 AM)Octo Wrote: We've had an extremely chilly May with snow off and on It finally warmed up a bit, was 18C yesterday and it's going to be another lovely day today. The main weather story of 2016 was the overall warmth. The year ended as the third warmest on record, finishing with an average yearly temperature of 63 degrees. Precipitation was regular and heavy enough to keep drought conditions from developing on more than localized and modest levels. 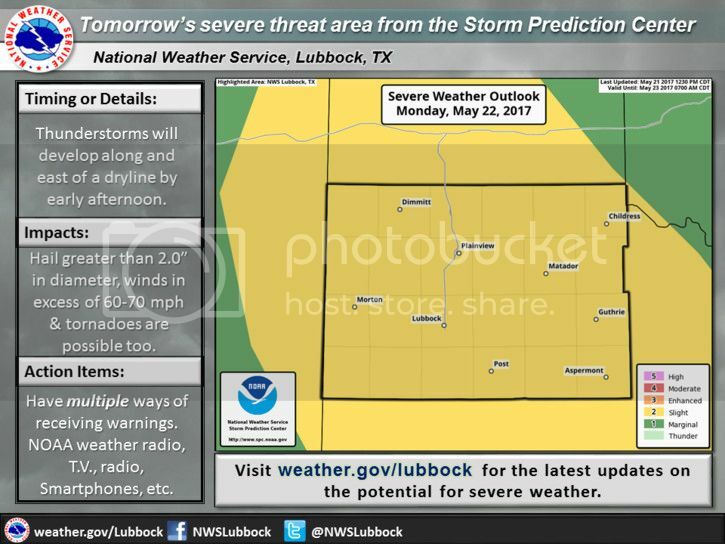 13.47 inches of precipitation fell at Lubbock during 2016, which was the 26th lowest in the historical record. April showers and May flowers. It has been really dry for 2017. With these new storms on our door, I pray that our farms get it all, I was out there the other day and the guy we form the farms out to for planting & harvesting told us he dug down 2.5 feet before he hit moisture. That bits, we could use a good crop this year. Hope you and JR have a really nice Spring & Summer this year Octo. My sister and her hubby now have a metal roof and she says it's great...no maintenance. They also sound-proofed the ceilings so not too much noise either from rain, hail and what not. Rain on a tin roof can be nice. Hypnotic, puts me to sleep. I am glad for you Octo, you don't have many nice days up there. We are having lots of rain (and overcast) conditions lately so we too have very few really nice sunny (not too hot) days to enjoy, but I think I will get outside and throw around some 3-way soil as I bought too many bags. Summer came to town today!